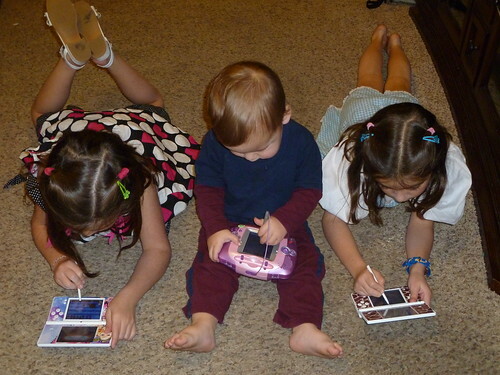 Luke has followed the girls around since Christmas trying to get their Nintendo DS from them to push buttons. He is very much like his daddy and loves to push buttons and use electronics. So to keep a little peace I dug out Anna’s old Leapster and let him play with it. He was so excited. Yes, I know it is pink, but he does not care. As long as it makes noise when he pushes buttons he is happy. Luke wanted to sit by the girls while they played their Nintendo DS.